On Monday he revealed on Twitter that he had been taking swim lessons for the first time since he was a child. 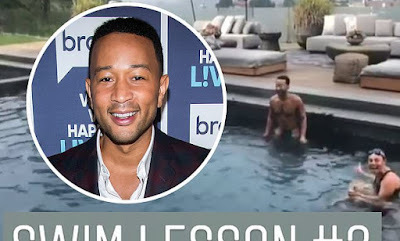 And on Wednesday John Legend took to his Instagram stories to share a video of himself in a small outdoor pool having his second session. It showed him pushing off from the side and reaching out with his arms as he kicked. The crooner managed to reach the other side of the pool in just one breath, probably thanks to his great lung capacity developed during his singing career. 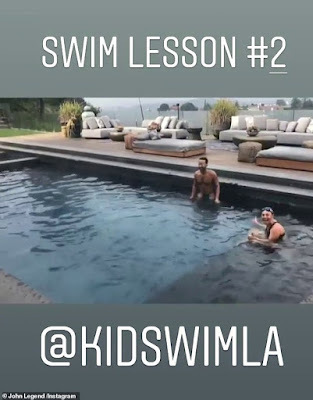 The 40-year-old didn't say anything during the video, but he wrote 'swim lesson #2' on the video and credited @kidswimla.